How does spending time in prison affect how you look back on your life choices? 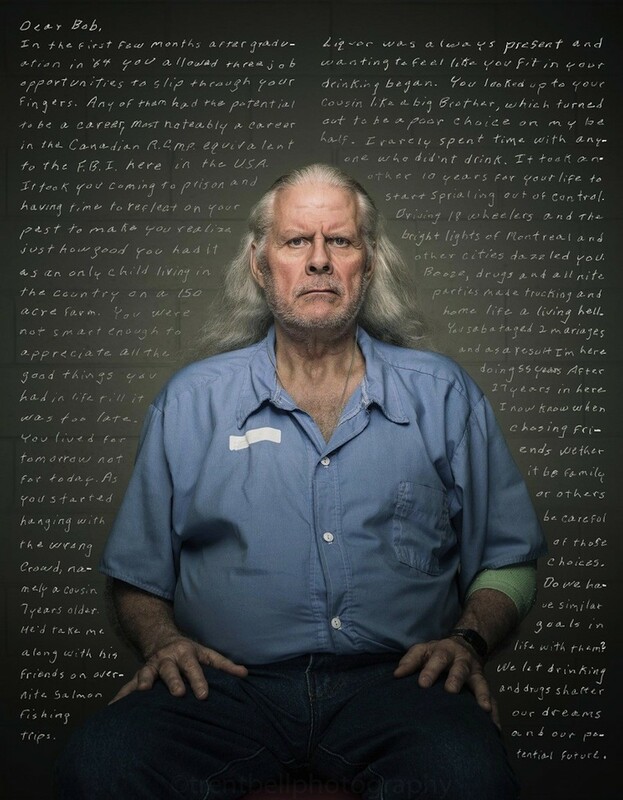 Photographer Trent Bell braves the poignant question in a photo series called "Reflect," which superimposes prisoners' portraits on top of handwritten letters they've written to their younger selves. Bell was inspired to embark on the series after a close friend of his was sentenced to 36 years in jail, changing Bell's view of just who was inhabiting these prisons and the stories of how they got there. Realizing just how much one's life could change with a single bad decision, Bell embarked on a photographic journey helping other prisoners make peace with their life choices, or at least share their stories. Each of Bell's images combines a somber portrait of a convict in uniform with a handwritten note giving warning, advice, guidance and inspirational words to their younger selves. One subject named Wes begins his letter: "Dear Wes, I'm reaching out to you today and I pray that the words of my heart are encouraging enough to keep you from making bad choices that could change your life forever." Another note from an anonymous subject reads, "I want to reach out to you and hopefully help save you from becoming me." Filled with regret yet punctuated with hope, the works depict a complex portrait of convicts' most personal thoughts and feelings. The unusual photo project depicts prisoners in an emotional and vulnerable state, casting light on a time in their lives before their identities were defined by their captive state. See the emotional project below and let us know your thoughts in the comments. An exhibit of the images premiered in Biddeford, Maine, at Engine in January 2013, accompanied by a video documentary by Joe Carter and photographs of prison officers and counselors by Corey Desrochers.